Many of us have been wanting to buy physical rhodium for some time now. 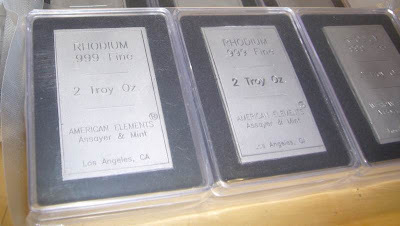 The Cohen Mint gave us rhodium, but there are some problems: they're only 1 gram (31 grams = 1 oz), inconvenient if you're looking to own a couple ounces, and very expensive because there isn't much of a discount if you buy 31 of them. I have respect for the Cohen Mint for marketing these coins and I even own a few grams myself, but I'm looking to own a single, heavier piece of rhodium! With the fabrication charges and "metal production charges" each 2 oz bar would cost $8073 plus shipping. And remember you have to buy 5 of them, so that's $40,365. I certainly don't have nearly that much, but I think I could swing the $8073. That's about $4000 per ounce, or 33% over spot, which for something this rare is, well, I don't want to say it's reasonable, but I don't really have any other choice. So, I'm looking to do a group buy (or "purchase syndicate" if you want to be technical) with a few different people. Ideally I would need 4 other guys (or gals), each of us paying $8100 each (I'm rounding up and estimating to cover shipping costs). When we pay, the price will be locked in regardless if the rhodium spot price fluctuates. Or, if a certain member would like two bars he would pay double and we'd only need 4 people. Before doing this I'd recommend we exchange phone numbers and any other information so we feel secure with each other. If we don't trust each other I'd rather choose another person to be member number five. My goal here is to own 2 ounces of rhodium. If that is your goal too and you don't have the $40,000 we'd be helping each other obtain that. Ideally, I'd receive the payments by bank check or bank transfer into my bank account. You could verify that the name and address on my bank account matches that of my driver's license which I could copy for you. If one member doesn't pay and we don't want to wait to find another, then I would return all the money to everyone. When the $40,000 is in my account I will pay AE by bank transfer. They don't have these bars sitting around so it will take about a month for them to fabricate and send the bars. When I get the bars, I would send them directly to you by certified mail where you have to be present to receive the delivery. I don't want there to be any delivery problems so I'd like to pay extra for the most reliable shipping and have them delivered at a time when you can receive the package at your home or office. This is a lot of money, so like I said I would even prefer it that we spoke on the phone enough that we trust each other. I'm definitely not the type to scam anyone but if you're anxious or have a problem with waiting the month for fabrication/delivery I think you'd agree that we shouldn't do this together. 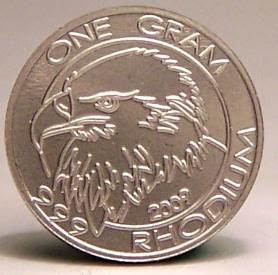 I'm not going to quote how cool rhodium is here or why you should buy it. 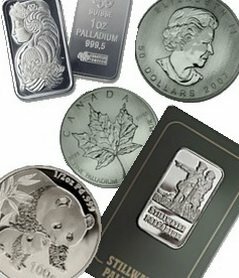 I'm looking for four guys who already want to own rhodium and will be serious about having 2 ounces in their hand by May 1, 2010. If you're with me, say "I!" My email address is under "AUTHORS & COMMENTS WANTED" in the right sidebar. If you've emailed me and not received a reply in a day or so leave me a comment by clicking on "COMMENTS" below this post. You'll be getting one of these guys. I don't know about you but I'm keeping mine in the case! At $8000.00 2OZ bar it is worth every penny, and in the very near future they will be worth alot more. 1 oz bars for $2800 each. I have a Rhodium Hippopotamus 9.38 troy ounces .958 23k purity. It is beautiful. I ordered from Cohen Mint 2 years ago. I have been chasing them since. They are a scam in my book as they ripped me off for $1000. No answers, no replies.There are others from my area (Massachusetts) that are actually physically looking for them in New York. Who knows where they are hidding. Good luck sending them any money, You will never see it again.